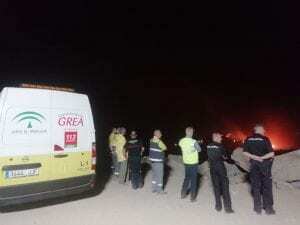 AROUND 20 homes had to be evacuated yesterday afternoon, following the fire in Casares. The emergency services, including around 100 firefighters and various amphibious water planes, helped to tackle the blaze which started around 4pm yesterday. Around 130 firefighters continued to work throughout the night to help control the fire. The Red Cross were brought in to help the evacuated families, supplying them with sandwiches and mattresses at the House of Youth, but they have since been allowed to return home. The flames are believed to have started at Finca del Álamo, with flames reaching a nearby plant that treats the waste of the 11 localities of municipalities of the Costa del Sol. 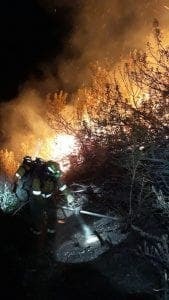 The Junta de Andalucía activated emergency level 1 yesterday evening as the fire was a threat to property and people but that was deactivated this morning. Contrary to many reports, the dog rescue charity ADANA did not have evacuate their dogs, despite the fire only being 700 meters away. President of ADANA, Mary Page, said: “Plans for every contingence have been put in place, whether that be for earthquakes or fires. At 9.40am this morning, INFOCA tweeted that the ‘fire was stabilised’ but work continues on the area.